Fidelity Rebates in Competition Law examines the treatment of fidelity rebates as one of the most controversial topics in EU competition law. The controversy arise from the lack of clarity as to how to distinguish between rebates that constitute a legitimate business practice and those that might have anticompetitive effects, as the same type of rebates could be pro-competitive or anticompetitive depending on their effects on competition. 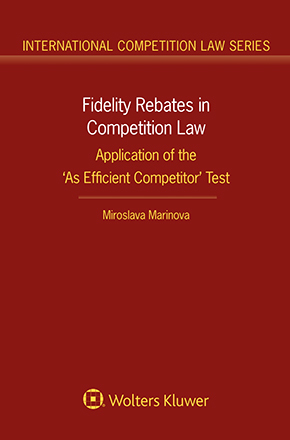 This book clarifies the appropriate treatment of fidelity rebates under EU competition law by offering original insights on the way in which abusive rebates should be identified, taking into account the wealth of EU case law in this area, the economics’ literature and the perspective of US antitrust law. The critical discussion on the case law is centred on the idea as to whether the ‘as efficient competitor’ (AEC) test is an important part of the assessment of fidelity rebates and in which circumstances it could be used as one tool among others. What motivated the EU Courts to treat fidelity rebates as illegal ‘by object’? Why has this case law drawn so much criticism from academics and other commentators? What can be learnt from the economic theories of exclusive dealing and fidelity rebates, and whether the strict approach of the Courts can be supported by economic empirical studies? What is the meaning attached to the notion of an ‘effects-based’ approach as an expression of the reform of Article 102? Why is the controversy regarding the treatment of fidelity rebates still a live issue after the Intel and the Post Danmark II judgments? In which circumstances the price-cost test can be used as a reliable tool to distinguish between anticompetitive and pro-competitive fidelity rebates? Can the effect of fidelity rebates be evaluated without necessarily carrying out a price-cost test? Can the AEC test be considered a single unifying test for all types of exclusionary abuses? What can be learnt about the application of the AEC test in fidelity rebate cases from the recent US case law? A concluding chapter provides an original perspective and also policy recommendations on how the abusive character of fidelity rebates should be assessed, including an appropriate legal test that is administrable, creates predictability and legal certainty and minimises the risk of errors and the cost of those mistakes. This book takes a giant step towards improving the understanding of the legal treatment of fidelity rebates and understanding as to whether the treatment of fidelity rebates could be effects-based, without necessarily carrying out an AEC test. This book thus contributes significantly to the practical work of enforcement agencies, courts and private entities and their advisors. The Treatment of Fidelity Rebates under US Antitrust Law: Predatory Pricing or Exclusive Dealing?